You might've talked about innovation with your IT department or software development agency lately and the words "design thinking” were surely mentioned. So what is it? Just another piece of business jargon to add to your arsenal or a useful tool? Or maybe even an overestimated hype? Nowadays every organization or business runs into a myriad of problems as business models become increasingly more complex. Globalization and advances in communication and technology, all add up to creating unique opportunities but also new challenges that are not easy to solve applying the old tested methods. That's where design thinking comes into play. Design thinking is basically a discipline that facilitates innovation and problem solving by taking the human-centered approach and focusing on the needs and wants of the end-user. It follows a string of steps and involves teams with mixed skills and backgrounds so it can combine their different strengths and points of view. Because it brings people in the same environment, with the help of an experienced facilitator, they can establish common ground. The result is that everyone's voice will be heard and collaboration is achieved in a fun and informal way. Everyone within the group is encouraged to share their ideas, experiences, skills and expectations so the group can work through the different options following the DT process and collaborate to reach a solution for the problem at hand. 3. Design Thinking´s main "Ingredients"
4.3 Example 3 – Healthcare U.S.
add to your arsenal or a useful tool? Or maybe even an overestimated hype? So why consider “design thinking”? We all know that the IT and the Business side of most organizations oftenhave a special love-hate relationship. 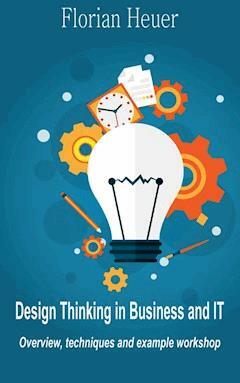 Design thinking might just be the approach to ensure a smoother working process and better results. A healthy atmosphere of collaboration between these departments in any company shouldn’t be a challenge to maintain as the organization applies design thinking. This way, IT can contribute with solution implementation and management whereas the commercial department can bring to the table their hands-on requirements. However, the situation doesn’t seem to have changed so much and there are still challenges faced between IT departments and the rest of the company. In some organizations functional departments such as Marketing, Finance or Customer Services are looking at ways to find solutions to their own problems. However, the need for an integrated approach, involving IT, is even greater nowadays. And the requirement doesn’t just cover major incidents. Collaboration and dialogue are necessary throughout and that’s where Design Thinking can play a major role to resolve the differences and ensure smooth running at every level of the organization. Nowadays every organization or business runs into a myriad of problems as business models become increasingly more complex. Globalization and advances in communication and technology, all add up to creating unique opportunities but also new challenges that are not easy to solve applying the old tested methods. That’s where design thinking comes into play. So how do we define it? Design thinking is basically a discipline that facilitates innovation and problem solving by taking the human-centered approach and focusing on the needs and wants of the end-user. It follows a string of steps and involves teams with mixed skills and backgrounds so it can combine their different strengths and points of view. Because it brings people in the same environment, with the help of an experienced facilitator, they can establish common ground. The result is that everyone’s voice will be heard and collaboration is achieved in a fun and informal way. Everyone within the group is encouraged to share their ideas, experiences, skills and expectations so the group can work through the different options following the DT process and collaborate to reach a solution for the problem at hand. Now let´s see what some top influencers in that field have to say about design thinking? So here are two definitions, the first one from Tim Brown, CEO of the design and innovation company IDEO and the second one from David Kelley, founder of IDEO and Stanford d.school. The other way to describe “design thinking” is as a process of generating new and innovative ideas for solving problems that can be applied not only to business and IT but to all walks of life. By applying the principles and framework of design thinking, companies and organizations can address complex business issues and challenges and gain a competitive advantage as well. According to David Kelly, who adapted design thinking for the purposes of business, it uses the designer’s arsenal “to integrate the needs of people, the possibilities of technology, and the requirements for business success”. In this way, the approach is focused on the three main elements of a solution or a product, namely people, technology and business with the customer always being at the centre of it all. Customer focus is key for the success of any business project and this is also ingrained in design thinking where the customer is at the heart of any solution. The multifunctional teams that are at the centre of the approach are all guided by the core values of design thinking which are diversity, empathy and ambiguity(we´ll come back to these later). These principles are not new but with design thinking they become part of a consistent and repeatable process. As a discipline, design itself lies between science and the humanities. Design thinking as a formal method of problem solving in business and technology focuses on creating solutions starting with the end goal in mind. Alternative solutions are explored at the same time without the fear of failure. Unlike analytical scientific methods, in design thinking any idea is acceptable in the brainstorming or ideation phase which encourages participation and input. The term ‘thinking outside the box’ was actually coined by design thinking practitioners and it is important as it perfectly describes the fact that brainstorming encourages any idea to be brought into the equation.